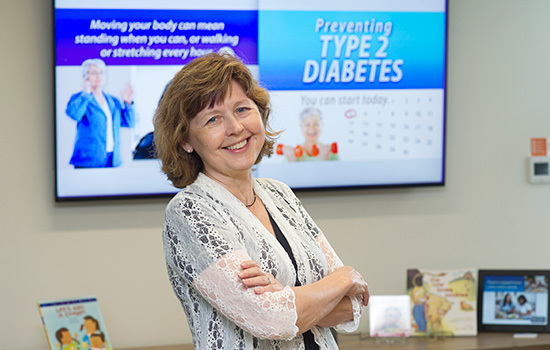 Barbara Lohse, head of the Wegmans School of Health and Nutrition, has big plans to expand the program’s academic offerings and community outreach. Nutrition management has long been a staple at RIT, and Barbara Lohse is ready to take it to the next level. Lohse—head of the Wegmans School of Health and Nutrition in the College of Health Sciences and Technology— is laying groundwork for a national presence for the school formed in 2014. Prior to RIT, Lohse developed programs and services as a lead researcher of SNAP-Ed, formerly known as Food Stamps Nutrition Education, at Penn State University. She brought with her the Nutrition Education Engineering & Designs (NEED) center—a repository of her nutrition-education products. Lohse and her RIT team have adapted these community nutrition initiatives for the Rochester region. This fall, Lohse and Elizabeth Ruder, assistant professor in the Wegmans School of Health and Nutrition, are rolling out “NEED for Tots” at 16 Volunteer of America preschools that serve children from lower-income families. Ruder won an RIT boot-camp grant to support the program. In September, Lohse and Ruder trained preschool teachers on teaching nutrition and the underlying message that “meal time is family time.” The program teaches children to role-play mealtime conversations, try new foods and learn activities to share with their parents. Lohse’s corresponding online programs, “About Eating” and “Meal Time is Family Time,” advise pre-school teachers, parents and caregivers about feeding children and are available on the NEED website (needscenter.org) as well as apps for mobile devices. Lohse and a colleague at Colorado State University are collaborating on a project that explores how teaching slightly older children to cook can improve their health and nutrition, as well as their families’. Funds from the U.S. Department of Agriculture’s National Institute of Food and Agriculture support this ongoing project. Lohse also is focused on creating new programs for the Wegmans school. A bachelor’s degree in exercise science began this fall and a master’s degree in the management of health and well-being is under development. Lohse also seeks to broaden the BS in nutrition management to offer an option forstudents seeking nutrition science but not the specific requirements necessary for becoming a registered dietitian. RIT’s nutrition management program is a “well-worn path” for students pursuing careers as registered dietitans. Lohse plans to open up the degree to a broader group of students who want to pair a degree in nutrition with public health, medical school or community education, for instance. “I’m doing this to expand the program to more people yet retain the strength of the registered dietician route,” Lohse said. Once these programs are in place, Lohse will turn to her “ultimate goal,” developing a Ph.D. in nutrition education or applied nutrition. She foresees future alumni developing curricula that can be used across the nation, becoming consultants for local and state nutrition programs or working for the federal government, such as the Center for Nutrition Policy and Promotion, she said. “I would love for them to say, ‘Let’s hire that person who got their doctorate at RIT because RIT’s really good at nutrition education,’” Lohse said.